In fruit flies and mice, the mismatch between sweet taste and fewer calories sends the body into "feed me" mode, the journal Cell Metabolism reports. The researchers, however, say more work is needed to make sure that the billions of people who regularly consume sugar substitutes don't have the same reaction as they saw in their animal tests. The Australian team looked at brain signals linked to appetite and pleasure in the insects and rodents, as they restricted what they could eat. Some were given a diet that contained natural sugars while others were fed the same diet plus added low calorie artificial sweetener. The researchers from Sydney University found that when sweetness and energy was out of balance for a prolonged time - nearly a week for the fruit flies and mice - the brain compensated, sending signals in a bid to increase the number of calories consumed. Given the chance, these insects and animals responded by eating more. 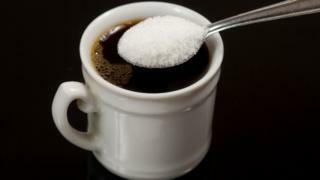 Researcher Prof Greg Neely said: "When we investigated why animals were eating more even though they had enough calories, we found that chronic consumption of this artificial sweetener actually increases the sweet intensity of real nutritive sugar, and this then increases the animal's overall motivation to eat more food. "The pathway we discovered is part of a conserved starvation response that actually makes nutritious food taste better when you are starving." The researchers say human studies are needed. Dr Ros Miller, a scientist from the British Nutrition Foundation, said the weight of evidence so far in people suggests low calorie sweeteners do not increase energy intake in people. "The idea that foods and drinks containing low calorie sweeteners might increase appetite and promote obesity is not supported by the vast majority of studies, including randomised controlled trials in humans." She said the relevance to humans of this latest study was "questionable". "The simplicity of the diets consumed by the rodents in these types of studies is in contrast to our highly complex diet. "In our diets, sweetness does not reliably predict the energy contained within foods and drinks. We are more likely to use a combination of food and drink characteristics, including taste, flavour and texture, to predict energy content, rather than simply sweetness."